As 2012 has been a relatively good year, it should end with a bang! I am playing santa by organising a Havaianas Flipflops giveaway! Okay so I previously won $500 Zalora.sg voucher from 98.7FM competition earlier this year and have only used up $100 on 2 new pairs of Havaianas. I was wondering what I should do with the remaining $400 since I don’t have much to buy on Zalora.sg and I thought… WHY NOT SHARE THE JOY? And since we Singaporeans are so into Havaianas (we wear Havaianas to school, to the beach, to the shopping malls, just anywhere! ), I have decided to spend $400 on these comfortable flipflops. $200 will be allocated to my friends and family members. 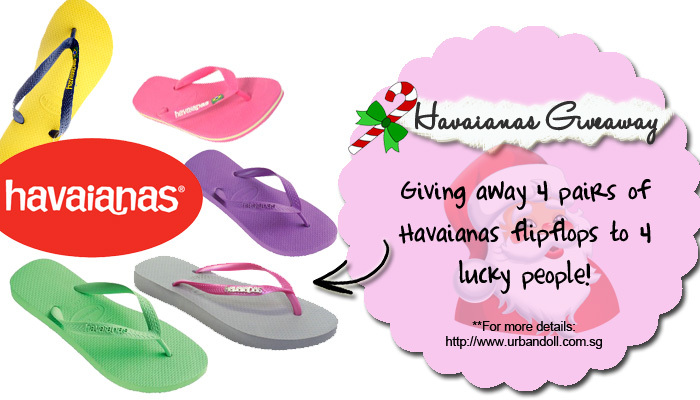 And the remaining $200 will be used to buy 4 PAIRS OF HAVAIANAS FOR 4 LUCKY READERS! ANYONE can join this competition, as long as you are living in Singapore.. You may access the Havaianas catalog here: http://www.zalora.sg/havaianas/. Please note that each pair of flipflops cannot cost more than $39.90. Please read the rules clearly before joining. Click on the Leave a Comment link on the black bar at the bottom of this entry. 1) Each person is only entitled to one pair of Havaianas. 2) Urbandoll.sg will only buy from Zalora.sg using the vouchers. 3) Invalid entries will not be counted. 4) Random.org will be used to select the winners randomly. 5) Urbandoll.sg reserves the right to make any changes to the giveaway details. 6) Urbandoll.sg holds the ultimate decision to choosing the winners. 7) Submission of entries will end on 15th December 2012. 8) Urbandoll.sg will announce the results by 20th December 2012 through http://www.urbandoll.sg and email. I have included my Name and email in the comment boxes. 1.What you like about my blog: I like a non pretentious blogger, no diva aura and all. You’re so down to earth! 2.What you hope to see more of on my blog: More beauty tips! awesome editing/designing! The way you edit your pictures by adding in words with lovely fonts and digital scrapbook embellishment images (like in the Daiso posts!) make me stare at them for ages, thinking “this is real good stuff!” 😀 Plus, the supersuper cute backgrounds surrounding your posts are forever so nice, it adds a real nice touch to the blog layout <3 love it! In terms of content, I absolutely adore how you always seem so sincere about sharing your experience and opinion, plus how detailed you are! I keep re-reading your Bangkok post to plan my trip because I feel like yours is really the best there is! Places to go in Singapore? You thoughts on + experience in places where people can spend quality time with their loved ones! What you like about my blog: food post and hauls. You can really write well! What you hope to see more of on my blog: hauls and travel posts! What you hope to see more of on my blog: I hope to see more posts on makeup and skincare tips as well as interesting food finds! Probably dinner places or dessert places! What you like about my blog: Beautiful blog layout and photos! What you like about my blog: I like to read about the food places you visit. All the yummy looking food pictures makes me wanna try the food. I love the design and the fact that you can write really well! 😀 And also how you don’t mind sharing stuff! Hi Keline, I like that you are sharing and generous in all your posts, always willing to give tips to your readers. Thanks to your sample post, I have been saving a lot of money by requesting to sample them first! So thank you so much for that. I also like your trips to the states, various shopping hauls. I only found your blog recently but you have gained a loyal reader! What you hope to see more of on my blog: More food reviews and your journey as a blogshop model aka life stories of any sort. kekeke. I believe you would be able to inspire young girls like me. 1) I really like how you personalise your blog. The pastel pink background, clear neat fonts, amazing quality of photos & not-so-lengthy posts make it easy for readers to read, even on the Go! The posts on overseas trips are Fabulous! In fact, my gal friends & i just came back from a BKK trip, totally inspired by your hauls. I also like the Portfolio section of your blog. Who doesnt like beautiful pics right? 2)It would be great if you share with us more about your life (eg. outings with friends & family) and your views/thoughts on things happenening around you to individualise your blog. And maybe an occassional video log of you to connect more with your readers? 1. We have the same hobbies: shopping, travelling, and nail art. It is a joy to read your blog! 2. You can post makeup and vlog videos. I like how you posted up your hair bleaching process. Hopefully, you can teach us makeup too! Same as you, I am a fan of pink objects too! But you are so pretty! (1) I first chanced upon your blog when you posted your holiday at Australia. I thought you really looked great in your holiday photos taken in Australia. Ok. Let’s start with this. I’m a guy, so the girly stuff are not suitable for me. What attracts me here is mainly because of the reviews you gave for some restuarants, especialy places like pique nique, Choupinette and Spruce. Other than that, I appreciate some of the landscapes you photos offer. It amazed me that you can find those lovely places in Singapore. More food reviews and photos with nice landscape! 2. Please update more regularly and do a makeup tutorial! I once watched a short film video that you have acted in but there was no talking! *disappointed* >.<"
2.More giveaways and sharing of latest items that you bought! 2)more reviews of food outlets and hauls! How it talks about almost everything XD Free samples, Daiso, brunch restaurants, skincare reviews… It’s a refreshing read and you post quite often too! The food pictures look delicious and I find it interesting that you love Daiso so much… I can’t stand the place! Haha it gives me a headache and it’s always so crowded. Outfit shots maybe? (: Or more recommendations for food places! I like how you rated the restaurant in one of your recent posts! Size: UK 6 I think that’s equivalent to US8.5/9 right? 1.What you like about my blog: I’ve been following your blog to get inspirations and tips on fashion, skincare and make up. 2.What you hope to see more of on my blog: More Giveaways like this! 1. What you like about my blog: You’re really pretty and unpretentious. I get a lot of my fashion inspirations from you. 2. What you hope to see more of on my blog: More fashion and make up tips! What you like about my blog: HI! like that the background is floral print! cause i love florals too heh. and also how you selflessly share free samples etc to your readers. What you hope to see more of on my blog: more updates i guess! What you like about my blog: I like the floral theme and definitely the food haunts you’ve been sharing. What you hope to see more of on my blog: Your skincare and makeup routine, beauty faves and more food haunts! 1. What you like about my blog: Simple, straight forward and easy to read. Photo is super clear and honest tips and comment from you. 2. What you hope to see more of on my blog: More tips and ideas for beauty and food. =) Love those sample, cheap deals or promotions as well. I actually started reading your blog only about one month ago but i fell in love with it! I like that your blogpost are very personal and real ( like what you do on a normal basis and your life) which makes me able to relate and keeps me coming back for more 😛 I love how you introduce new food places for us blog readers!And recommend any nice products to us! ( like where to get free samples!) As i am travelling to bangkok in two weeks’ time your bangkok post came in handy and is so super interesting to read!Your loots are super nice and i hope to go there to pick out nice stuffx Lastly your layout and pictures quality are awesome! Of course i also find you super pretty and cute! I hope to see more different brunch/dinner places and of course any overseas trip that you go to!! 1. What you like about my blog: You are my fashion inspiration! 1 very user-friendly when i wanted to scroll up and copy the link even have the “top” button!! What you hope to see more of on my blog: More great deals and joy shared! 1.What you like about my blog: Your generous giveaways! 2.What you hope to see more of on my blog: More food reviews! 1. Love ur food reviews, to Daiso hauls!!! What you like about my blog: I gave me a lot of information on latest beauty products and where to find cheap manicures and all. Love how you share your daily life and places which you visited for your meals. 1.What you like about my blog: FOOOOD! I love all your food posts! All look so delicious! 2.What you hope to see more of on my blog: HEHE MORE FOOOOOOOOOOD POSTS! & travel posts! Super jealous of the loots you got in BKK! 1.your blog looks awesome, the reviews about places are great and i love the way you edit your photos such as add captions. Hello Winnie, thank you for your entry! :D Nice to meet someone with tanned skin as well! Yes I do have a ring light in my room, I think it’s great! Haha makes everything looks so much better. I use a Canon S100 or Canon 60D 🙂 I use both to take pictures of food hehe. What you like about my blog: different advertorials from beauty,food to clothing! A great way to find out more about different brands and check out new stuff! 1.What you like about my blog:I like the way your entries and photos are done & the beauty tips(Review of products & Reviews on Food. Beauty tips and recommendation of good products. What i like about your blog is definitely got to be the content. There is a wide array of ads you do ranging from food to even fashion!This helps me to better know my girlfriend’s fashion sense and many others. What i hope to see more on your blog is definitely more food reviews/recommendations, despite singapore being a small country, it is one hell of a food hub! Just to comment on you, I like how you balance your university life with all this. I’m just amazed. Wish I could be like you. You don’t look so stress too. What you hope to see more of on my blog: Definitely more food/restaurants review. Teehee. What you like about my blog: Thank you for being so awesome! I really feel that the way you deliver your review felt so true. Often we go to new restaurant and we cannot decide what to choose to eat and end up choosing the wrong one, but with your reviews, we can then choose wisely! Your cosmetics and skincare reviews definitely help many girls in some way! We may not get the chance to attend such workshops like you, but by reading your post its as though we attended it! You don’t fail to provide us with tips and personal feedbacks which is the best part of your post that i love! What you like about my blog: I like how you are super sincere and honest in all your posts, and how you always say thank you! 😀 And of course, the beautiful design of your blog! I like to read your blog because it gives me a very good idea on food to try, new places to go, holiday ideas and such. And you are so very cute! Your photos always either have you frowning or smiling. Haha! Ways to improve is perhaps you can blog more about your family, your dressing (like look-book kind) and where to get them (“outfit of the day”) in Singapore. What you like about my blog: different advertorials, very creative, neat and wide-ranged. very informative method to find out more about reviews and stuff! What you hope to see more of on my blog: skincare & makeup regimes!!! What I like about your blog? I like the freebie stations you provide- THEY’RE AWESOME! 😀 Thks BTW- For the free stuff you introduced me to. What I hope to see more on your blog? Certainly more offers! ;D I’m a very honest person and I admit- I LOVE free stuffs. Firstly, I love the floral background! It makes the whole blog feels so feminine and sweet. Secondly, I like how diverse your blog covers, featuring from advertorials to fashion to daily random stuffs. You may notice that some other bloggers are always repeatedly featuring the same old things which may kind of bore the readers. Thirdly, I like how your posts are filled with many many many pictures! Wordy blog is a lullaby to me! Of course not talking about advertorials since you got to promote the products with words. What you hope to see more of on my blog: more of your personal self like daily routine stuffs, your boyfriend / family. Your blog is probably the most interesting I’ve read, because I love pictures (they paint a thousand words, don’t they 🙂 and yours are always beautifully taken!) and down-to-earth posts. You’re one sincere and lively blogger! What I hope to see more of on your blog: Travel tips, shopping places and more importantly, local hangouts! Would love to know more local places to dine, chillax, etc.